The Usenet provider UseNeXT is one of the most known companies that guarantee you access to the Usenet. The Usenet is a worldwide distributed communication and download platform where terabytes of contents are available. Users discuss about many topics in several newsgroups. The biggest newsgroups are the so-called big eight: comp (Computer), sci (science), soc (social discussions), talk (examples: talk.religion, talk.politics), rec (recreational), news (news), and misc (miscellaneous topics). However, a more open and unstructured newsgroup category is “alt”. The biggest subsection of the “alt” newsgroups is the category alt.binaries, where Usenet users are able to download binary files. If you want access to this infrastructure you can go to usenext.com. This Usenet provider offers you several Usenet download packages where you can choose one package that fits with your download behavior. 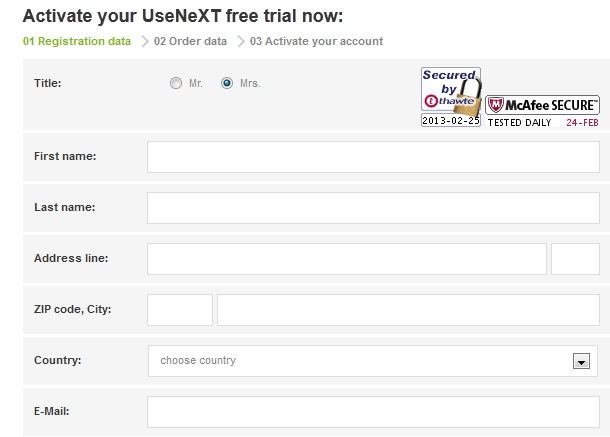 Just fill out the following folders and you can test UseNeXT for 14 day free of charge with a download package of 300 Gigabyte.